How to Get Your Website to Show Up On Google Right Now! How to Get Your Website to Show up on Google — Right Now! Consider for a moment that the Top 3 Google search results are ad Spots and they get over 40% of the clicks. Here’s a Hint – You Use Google Adwords to Dominate Search! That’s right, you use Google Adwords to buy your position at the top of Google Search.. If you own a business, there is absolutely no reason you shouldn’t be using Google Adwords to get your website to show up on the top of Google search in order to reach your customers, drive traffic to your website and convert those visitors to sales. Over 66% of small businesses state that generating new leads is the most critical concern. That makes it all the more interesting that according to a recent survey by the Small Business Authority (SBA), less than 50 percent of small business owners in the United States think of inbound traffic from search engines as an “important” source of future business. Considering that 86% of consumers use internet search to find a product, service or local business it only makes sense to use Adwords to put your business in front of those consumers. B.T.W. Google Adwords is the only way to guarantee that your website shows up on the top of Google search results. So keep reading to learn how to get to the top of Google search and stay there all while converting that highly targeted traffic. Have you just read read 20 articles that start like this? Well… OK, so what do I do to get my site on google? Chances are that you’ve already covered the basics listed below, and you’ve probably also discovered that there’s a BIG difference between getting Google to index your site and getting your site to show up at the top of the first page. Submit your website to Google – While your site is likely to be discovered by Google without you doing anything at all, you can speed up the indexing process by submitting your site to Google through this link: Submit site to Google. While you’re there register your website and submit your sitemap to be automatically updated. Google My Business – You’ll want to give your site every advantage and to do so you will want to register your website on Google my Business straight away. Click Here to Start. Meta Title and Description – Make sure your getting the most out of your page titles and descriptions. Eventually, you decide that simply getting your website indexed by google isn’t going to cut it. From That point you really have two choices: SEO or Adwords. SEO and Adwords are two completely different strategies to getting your website on Google’s first page. Why Are We Primarily Focusing on Adwords to Get Your Website on Google? You’re pretty much doomed. If you’re trying to get noticed and rank organically on the first page for popular industry keywords like “SEO Guide,” it’s not going to happen anytime soon. If you’re just starting out, you’ve got no domain authority, a tiny backlink profile, and hardly any traction as a result. The truth is; pretty much every search term with relevant search traffic in any industry already has hundreds of millions of search results optimized specifically for that query. Fact: Sites that have been around for a long time are going to dominate the top page rankings for popular industry keywords. There is no way around this. Every niche has dozens of sites that are years ahead of you in terms of building authority and backlinks. It’s not going to be quick or easy to knock them out of their Google rankings. So, What can you do to get that Google first page traffic? Just Ask Us How to Get Your Site on Google Right Now! Why Use Adwords to Get Your Website On Google? Get Customer to Your Door. Achieve Your Marketing Goals with Adwords. Let’s breakdown Google’s Search Results above the fold to see why your website needs show up their. Google owns 71% of the search market share. (Netmarketshare.com). It should go without saying that if you want your business in front of your customers online, then Google Adwords is the place to start. More importantly, there is evidence that paid search traffic converts better than organic traffic – with conversion rates up to two times higher. (Conversion rates vary by industry, of course, so you will want to get a proposal from an trusted Google Adwords Partner just to be on the safe side.) That being said, paid search traffic is more targeted and qualified (due to granular targeting options that Google Adwords offers), the search queries that result in ad clicks are much more likely to be commercial in nature, rather than informational. Get Your Free Adwords Consultation Today! How Much will it Cost to Get My Website to Show up on Google? The #1 Question Every business has about using Google Adwords – How much will it cost? Don’t look at the Cost of getting Your Website to Show up on Google Top Results! It’s much better to Calculate an Adwords strategy that generates an ROI your business can work with. 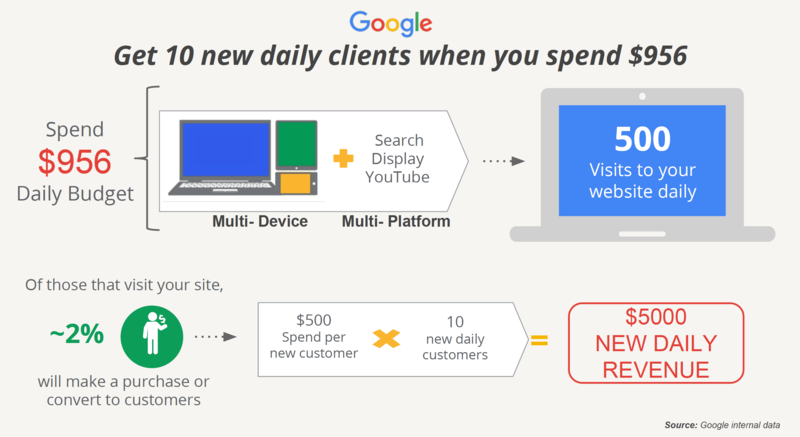 Don’t Freak Out About the Cost of Adwords! The number one deterrent for many businesses ever trying Adwords is the projected cost in actually running a campaign. The graphic above is part of an actual proposal we used for a client. At first glance, a $956 daily budget like the one shown above, could potentially be a shocking number for many businesses. Ad spend doesn’t matter. It doesn’t matter how much you spend on Adwords if your return on Ad spend is profitable. In this projection, we’re calculating a projected $5,000 daily revenue. In the first 30 days we actually ran an average of $535.45 in daily ad spend. We drove an average of 420 visits per day. The initial application purchase was $500 per customer at 2.45% Conversion Rate. 10.29 Sales per day X $500 = $5,145 per day. Another thing to keep in mind is that every Adwords campaign is unique. What you spend to dominate Google search is going to be dramatically different than what another business spends. Say for example that the ad spend referenced in the illustration above scares the Bejeezus out of you – that’s ok.
Perhaps you have a small start up and you’re looking for local visibility. Well, your budget is going to be a LOT smaller than a national furniture store chain. A great example is a small town chiropractic clinic. They came to us wanting to gain new local customers and were having trouble with their online visibility. For an ad spend of about $250, we were able to get their website at the top of google search for all of their primary service areas. • about 35 new customer phone calls every month. • about 15 website form submissions every month. • that puts their customer acquisition at about $2.50 – not too shabby. Well, that sounds good, but would do you use Adwords for your business? That’s a fair question, and yes, we do use Adwords to generate new leads and take over Googles’ search results to promote our business – take a look! I think it’s important to point out on mobile, we take up about 80% of the mobile search results with paid ads! Are You Ready to Get Your Website to Show up on Google Search Results? There’s nothing stopping you from getting your website to the top of Google’s first page – check out these stats! We helped these businesses get their websites on Google Search and dramatically increased revenue and ROI. To start off we want to work towards a 10% increase in sales, so we look at the average online sales for a 30 day period as well as the average conversion rate for the store. Based on an average CPC of $1.12 we would require a budget of $4,000 per month to drive an additional 3,600 visitors and at an average order value of $240 with a conservative conversion rate of 2% this would provide a return of $17,280. This was a 7.57% ROI or increase in sales. For some businesses being at the top of Google Search is essential. One of the most difficult marketing strategies for small businesses is mastering Google PPC for local advertising. There are many different ways to utilize Adwords and one of them is to begin building brand identity locally. DishRepublic contracted us to design and develop their eCommerce idea for a local fresh dinner delivery service where the meals are prepared by local gourmet chefs. They also contracted us to launch a local Adword PPC campaign to help build and support their brand online. This campaign was to work in conjunction with local print and television media all geared towards promoting the brand name. Consequently, this would drive many “branded” search queries for which the website would need to capture and funnel traffic appropriately. For an average 30 day campaign cost of only $250 we were able to bring in an average of 200 laser targeted visitors at a whopping 1,314% conversion rate making the cost per conversion only $.15. Get a PPC strategy that works! Google’s Key Ranking Factors for Website Ads and Their Position. It’s not just about getting your website to show up on Google — it’s about creating a positive ROI. Google Adwords or Pay-per-click (PPC) marketing consistently ranks as one of the most cost-effective forms of digital marketing. As many businesses new to Adwords discover; it’s easy to set up campaigns, but not so easy to know which metrics to pay attention to in order to optimize your adwords ads to maximize your CPC, Quality Score, Rank Position and ultimately generate a great return on investment. When running Google Adwords it’s important to pay close attention to the following metrics in order to not only get to the top of Google Search and stay there, but to make sure you’re doing it cost effectively in order to produce return on your investment. Arguably, the most important metric to monitor in a PPC campaign is revenue-per-click (RPC). This is also arguably one of the most undervalued metrics for monitoring your Adwords campaigns. As the name suggests, this reveals the average amount of money you earn for each click. If you pay $100 for 100 clicks that generate $200, your RPC also referred to as (EPC) Earning per Click for that Adwords campaign is $2. This is a much more granular metric derived from the overall ROI and is an essential metric to determine where to trim the fat in specific Ad Groups. Business owners and digital marketers should constantly optimize their PPC campaigns to achieve the highest EPC possible, as this usually indicates greater profits. Pay-per-click (PPC) marketing consistently ranks as one of the most cost-effective forms of digital marketing. Whether it’s Google AdWords, Bing Ads, Facebook Ads or others, though, you should pay close attention to the following metrics when utilizing PPC. We pay close attention to your average cost-per-click (CPC) when promoting your products or services on Google Adwords. With PPC marketing, it’s difficult to tell exactly how much you’ll pay for clicks – and that’s okay. We can generate fairly accurate Google Adwords proposals that layout a plan of attack and estimate your likely Ad spend as well as Return on Investment. That being said, no one but Google has all the inside information and that’s why the first 30-60 days of running an Adwords campaign are so important. What we focus on is the average cost-per-click. Why? Because, as long as your RPC is higher than your CPC, you’ll have a profitable Adwords campaign! Click-through rate (CTR) is defined as the percentage of users who click your ad. If 1,000 people see your ad, and 100 of whom click it, your ad has a CTR of 10%. Of course, that’s a pretty high CTR, so don’t feel distraught if you fall shy of the 10% mark. It’s common for Ads to start off in the 2-4% CTR range and this is why we set up multiple ads to rotate at all time. This allows us to optimize your PPC campaigns for a higher CTR. After allowing both ads to run, we delete the ad with the lowest CTR and replace it with a new one. We actively continue to repeat this cycle indefinitely continued optimization of your Adwords campaigns. In addition to CTR, Search Impression Share is an very important metric that is found by dividing the number of impressions received on the Search Network divided by the estimated number of impressions you were eligible to receive. Impression Share is a vital metric that most businesses may not even be aware of and is most certainly overlooked and undervalued. Impression Share helps to identify areas of missed opportunity due to budget constraints: If you have a strong performing campaign or ad group that is missing out on Impression Share due to Budget then you can simply increase budget here to gain additional conversion volume and overall campaign performance. More importantly Impression share can tell you how much of your audience views you’re capturing and how much of your advertising dollars are being wasted. Did you know the average AdWords account wastes 76% of its budget on search terms that never convert. Our focus is to make sure your ads are covering between 75%-98% of their impression share, but more importantly that these ads are effective conversion drivers with a great ROI. Of course, you should also monitor the position of your PPC ads. Conventional wisdom should lead you to believe that #1 position ads will receive the most traffic. However, sometimes it’s best to avoid the #1 position right at the top of Google search results and instead opt for a lower, more cost-effective position. Being at the very top of Google generally costs a LOT more than lower ranking counterparts. Consequently dominating the top of Google search results with a #2 or #3 Ad position can be much more profitable that going after that #1 spot. Our goal is to help you score more clicks and conversions for less money. There are so many details that cause DIY’ers to fail in getting their ads to rank at the top of Google, let alone do it cost effectively. One of the biggest missed opportunities by DIY’ers is “ad extensions”. This is one of the easiest and fastest ways to improve quality score to boost your ads performance. Ad extensions provide the opportunity to add more information to your ad than just the standard headline, URL, and ad copy that most newbies use. This extra information helps your ad to stand out and get clicked, which in turn will lower your cost per click and in many cases improve conversion rates. There are a LOT of options to extend your ad with powerful messages and incentives that will improve ad performance and your ad position. We Know How to Get Your Website to Show up on Google! Just let us provide a complete Adwords strategy proposal with a transparent estimate of what it will look like to get your website to show up on Google and start converting that highly targeted traffic into revenue for your business. The fact is that PPC (Pay-Per-Click) advertising is the most accountable form of advertising online. Google Adwords is a flexible, effective and completely accountable marketing avenue. Paid advertising campaigns allow you to establish your own budget and put your ads in front of your customers right when they’re looking for you. Most people run into trouble by dabbling in PPC and this is a sure fire way to waste money and clicks. How Do We Determine Google Adwords PPC Pricing and Fees? Our Google Adwords support and Management pricing is based on the specific budget of the campaign and can also vary depending on the level of campaign development and implementation, such as landing page design, re-marketing and website conversion analysis reporting. We have included a services and pricing chart below for more details on our PPC Management. As a Google Adwords partner, we typically combine PPC advertising with onsite optimization and contextual link building to increase organic search results. We can also incorporate social media publishing in order to create a well rounded campaign and also to avoid that “all my eggs are in one basket” type of scenario. It’s funny, many people are gun shy when it comes to Google and PPC advertising. Most new site owners lean towards pursuing organic search optimization without PPC. We don’t recommend doing that. What most people find is that organic seo is a “in for the long haul” marketing effort with little return on investment for the better part of the first year. Google PPC advertising run in conjunction with your organic optimization efforts can be a great way to bring in customers now. Finding the right Google Adword management company to help convert traffic and prevent dollars flying out the door is one of the most beneficial things your business can do. Pixel Productions Inc., will get your PPC campaigns set up and optimized for improved CPC and ad quality for conversions. We primarily focus on Google pay-per-click advertising, but certainly provide full coverage services which include Bing Search and Display networks or Facebook advertising. We take mobile devices into consideration when setting up your campaigns to ensure your business is always covered where people are searching. Looking for ways to get your eCommerce website to the top of Google? Keep up-to-date here. Don’t Fall for the Google Adwords Unlimited Click Scam!